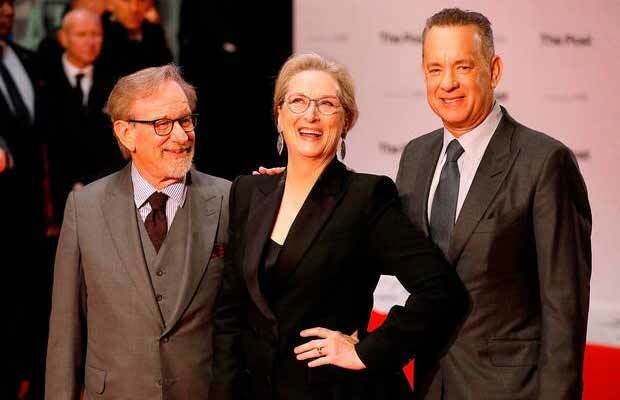 The lead actors Meryl Streep and Tom Hanks graced the London screening of ‘The Post’ on Wednesday, which releases in India today. The actress who won the Best Actress at the National Board of Review Awards for the film looked elegantly stunning on the red carpet, while Tom Hanks who too won the Best Actor for the Post looked dapper as he walked the red carpet. ‘The Post’ has been winning accolades and receiving rave reviews across the world. The film not just pleased the audience but also critics, as The Post bagged the best film, the best actor as well as best actress as the NBR awards. Starring Tom Hanks and Meryl Streep in the lead, The Post is a thrilling drama, which puts forth the story of dedicated journalists. The film revolves around the unlikely partnership between The Washington Post’s Katharine Graham played by Streep who is the first female publisher of a major American newspaper, and editor Ben Bradlee played by Tom Hanks. The duo is seen racing to catch up with The New York Times, in order to expose a massive cover-up of Government that spanned for almost three decades and four U.S. Presidents. In order to bring to light the truth, the two must overcome their differences as they risk their careers and their freedom. The film released in India today. Previous articleBigg Boss 11: A Day Before The Grand Finale, Puneesh Sharma EXPOSES Vikas Gupta’s Dirty Game! Next articleBigg Boss 11 Grand Finale: This Finalist Gets Evicted From The Show?